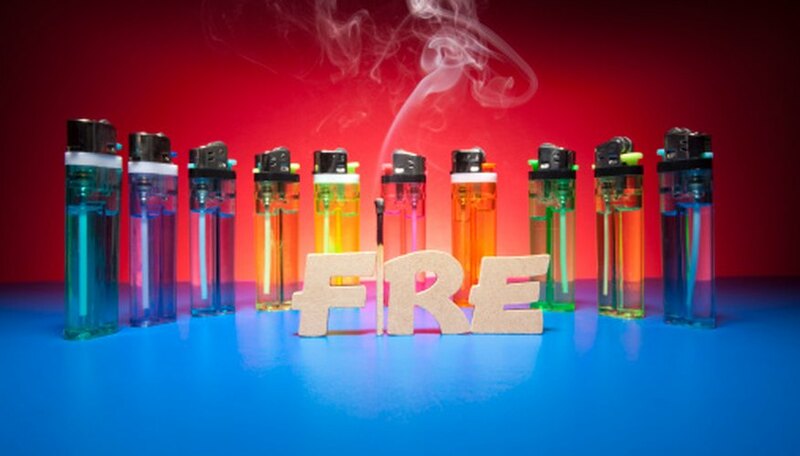 Butane lighters can be used for a variety of tricks, some dangerous, some not. Many people are familiar with "throwing a fireball" by filling up your hand with gas and then tossing the gas out of your hand as you light it. There are a few other tricks that you can do, some which will create an even bigger fireball. All butane lighter tricks should be done outside and far away from any flammable materials. Wear protective eyewear when performing any lighter tricks. Hold a butane lighter in your right hand. Open the gas flow valve all the way to the "+" side. Close your left hand into a fist. Press the end of the lighter into your clenched fist so that the metal tip is all the way inside your palm. Press down on the gas button but do not flick the flint. Allow the gas to fill your hand for five seconds. Release the gas button. Pull the lighter out of your fist slightly so that you can reach the flint wheel. Flick the flint wheel to light the gas in your hand. Watch to see if the gas in your hand ignites. Open your hand and throw the gas fireball forward with a pushing motion. Press down the gas release button on the lighter. Loop a rubber band around the button and the lighter handle so the button stays held down. Tape the lighter upside down to a metal post that is away from any flammable material. Ignite the lighter with a long fireplace lighter. Move back at least 50 feet to a safe spot. Watch for the upside down flame to melt the lighter handle and ignite the butane. (There should be a good sized fireball emitted after a few seconds.) Keep a fire extinguisher handy just in case the lighter ignites anything on the ground. Stand on a driveway or asphalt surface. Hold the lighter in one hand so that your fingers cover the top of the lighter. Move your fingers apart slightly so that you can grab the flint thumbwheel with a pair of needle-nose pliers. Pull the flint wheel from its housing slowly. Close your fingers around the lighter when you feel the thumbwheel loosen. Point the lighter upside down over a table and slowly remove the thumbwheel. Grab the flint and spring as they emerge from the hole beneath the thumbwheel. Stretch the spring out so that you can easily fit the flint into the middle. Hold the spring out in front of you, and heat the flint with another lighter for 15 seconds. Flick the flint with your other hand so that it flies free of the spring and lands at least 10 feet away. Watch for a large shower of sparks as the flint hits the hard ground surface.